In April 1926 the Curtiss Aeroplane and Motor Company initiated a design study for a 600 hp (447 kW), air-cooled aircraft engine. The engine was to have minimal frontal area while keeping its length as short as possible. Configurations that were considered but discarded were a 9-cylinder single-row radial, a 14-cylinder two-row radial, a 12-cylinder Vee, and a 16-cylinder X. The selected design was a rather unusual 12-cylinder engine that Curtiss referred to as a “hexagon” configuration. This engine was built as the Curtiss H-1640 Chieftain. The Curtiss H-1640 Chieftain “hexagon” or “inline-radial” engine. The image on the left was taken in 1927; note “Curtiss Hexagon” is written on the valve covers. In front of each cylinder pair is the housing for the vertical shaft that drove the overhead camshafts. The image on the right was taken in 1932 and shows a more refined engine with “Curtiss Chieftain” written on the valve covers. Note the additional cooling fins surrounding the spark plugs. In both images, the baffle at the rear of each exhaust Vee forced cooling air into the intake Vee. The Curtiss H-1640 was designed by Arthur Leak and Arthur Nutt. The Chieftain’s “hexagon” design was a combination of a radial and Vee engine. The intent was to combine the strengths of both engine configurations: the light and short features of a conventional radial with the narrow and high rpm (for the time) of a conventional Vee engine. The Chieftain was arranged as if it were a 12-cylinder Vee engine cut into three sections, each being a four-cylinder Vee. The Vee engine sections were then positioned in a radial form 120 degrees apart (each cylinder bank being 60 degrees apart). The end result was a two-row, twelve-cylinder, inline radial engine. The H-1640 resembled a conventional radial engine except that the second cylinder row was directly behind the first. An engine installation comparison of the air cooled Chieftain-powered XO-18 Falcon at left and a liquid-cooled D-12-powered Falcon at right. Note that while the Chieftain is a wider engine, it blends well with the fuselage and is shorter and not as tall as the Curtiss D-12. Each four-cylinder Vee section had the cylinder exhaust ports on the inside of the Vee and the intake ports on the outside. Each inline cylinder pair had its own intake runner and dual-overhead camshafts that were enclosed in a common valve cover. The camshafts were driven via a single vertical shaft from the front of the engine. There were four valves per cylinder. Cooling air was directed through each four-cylinder section’s exhaust Vee; here it met a baffle fitted to the rear of the engine and attached to the cowling. This baffle deflected the air and forced it to flow between the inline cylinders and behind the rear cylinder. The air then flowed into the intake Vee that was blocked off at the front. The air exited the cowling via louvers over the intake Vee. The Curtiss O-1B Falcon that was redesignated XO-18 while it served as the test-bed for the Chieftain engine. Note the exposed valve covers and the exhaust stacks protruding through the engine cowling. The pistons were aluminum and operated in steel cylinder barrels that were screwed and shrunk into cast aluminum cylinders with integral cooling fins. From U.S. patent 1,962,246 filed by Leak in 1931, it appears that the Chieftain’s connecting rods consisted of two halves that were bolted together. Each half was made up of one master rod and two articulating rods. The H-1640 Chieftain had a bore of 5.625 in (143 mm) and a stroke of 5.5 in (140 mm), giving a total displacement of 1,640 cu in (26.9 L). The engine’s maximum diameter was 45.25 in (1.15 m). However, a special cowling was used, cut to allow the valve covers and exhaust stacks to protrude through, reducing the diameter of the cowling to 39 in (0.99 m). The engine was 52.3 in (1.33 m) long and weighed 900 lb (408 kg). The Chieftain had a 5.2 to 1 compression ratio and was rated at 600 hp (447 kW) at 2,200 rpm but developed 615 hp (459 kW). When the engine was pressed to 2,330 rpm, it produced 653 hp (487 kW). It was equipped with a centrifugal-type supercharger that allowed the engine to maintain sea-level power up to 12,000 ft (3,658 m). All Chieftain engines built were direct drive but geared versions had been planned. In addition, some design work on a four-row, 24-cylinder version of 1,200 hp (895 kW) had been done. Side view of the Thomas-Morse XP-13 Viper with the Curtiss Chieftain engine and revised cowl. Not the louvers for the cooling air to exit the cowling. Because the engine had an even number of cylinders per each row, a unique firing order was developed that alternated between the front and rear rows. When the engine was viewed from the rear, the cylinders were numbered starting with the cylinder bank at the 9 o’clock position and proceeding clockwise around the engine. The rear cylinder row had odd numbers, and the front cylinder row was even so that the rear cylinder of the cylinder bank at 9 o’clock was number 1 and the front was number 2. The firing order was initially 1, 10, 5, 7, 4, 11, 8, 3, 12, 2, 9, 6 but was later changed to 1, 10, 5, 2, 9, 11, 8, 3, 12, 7, 4, 6 in an effort to smooth out the engine. The H-1640 Chieftain was first run in 1927 and flown in a modified Curtiss O-1B Falcon, redesignated XO-18, in April 1928. The Chieftain-powered test-bed aircraft was found to out-climb and have a higher ceiling than the standard liquid-cooled Curtiss D-12-powered Falcon. In addition, the top-speed of the two aircraft was the same, which was unheard of for that time period when liquid-cooled aircraft were faster than their air-cooled counterparts. However, the engine suffered cooling issues, and the aircraft was modified back to an O-1B in July 1930. 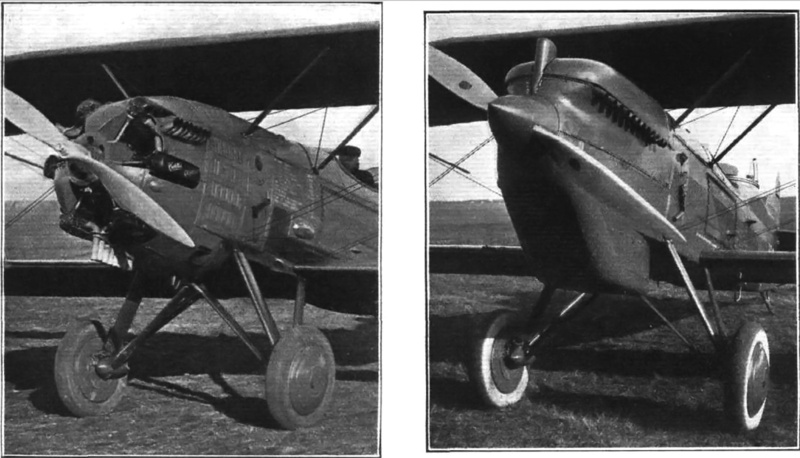 A comparison of the original cowling on the XP-13 at left and the updated cowling at right. The front of the cowling has been extended and angled out. The block-off plates in between the openings have been angled to funnel air into the enlarged openings. 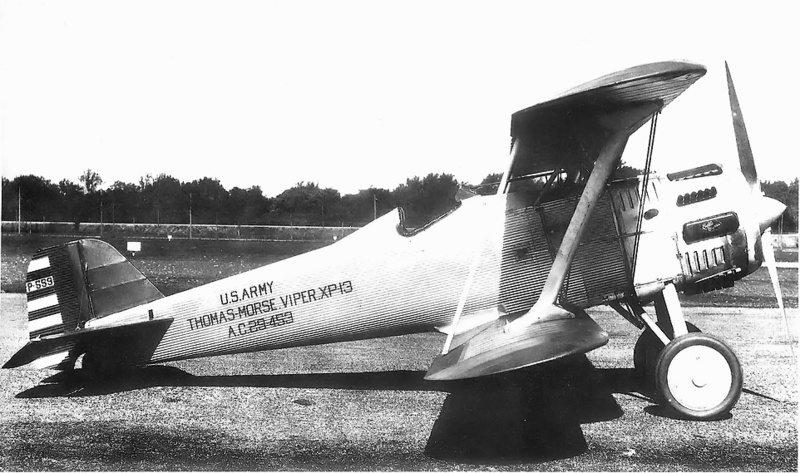 Thomas-Morse also responded to the Army’s interest in using the Curtiss H-1640. The company’s Viper fighter prototype was built to use the Chieftain engine. This aircraft was tested at Wright Field in June 1929 and given the designation XP-13. Engine overheating was encountered, and a revised cowling was tried in an effort to provide adequate cooling for the H-1640. The new cowling had enlarged openings, and the blocked off sections were angled to force more air into the openings. However, over-heating persisted. The XP-13 was tested until September 1930, when a Pratt & Whitney R-1340C engine was installed and the aircraft redesignated XP-13A. Even though this engine was not as powerful, it was lighter and did not suffer the cooling issues present with the Chieftain. The XP-13A was found to be 15 mph (24 km/h) faster than the Chieftain-powered XP-13. Curtiss had planned to produce the Viper under the designation XP-14, but the H-1640 engine was lacking support so no aircraft were built. 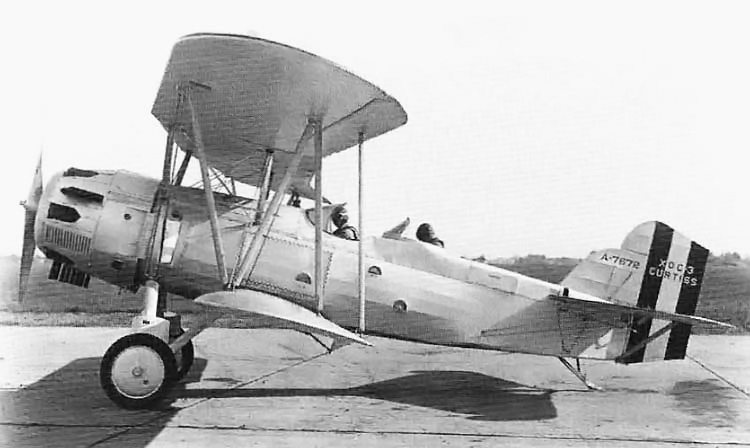 Another Chieftain was installed in the Navy’s second Curtiss XF8C-1 prototype in 1930. The H-1640-powered aircraft was known as the Curtiss XOC3. It too suffered from engine over-heating. The Chieftain engine remained installed in the XOC3 until the aircraft was removed from the Navy’s inventory in April 1932. Detail view of the revised cowling on the Chieftain-powered Thomas-Morse XP-13. The image on the left illustrates the angle of the block-off plates. Note the six, instead of eight, exhaust stacks of the upper cylinders. The last two stacks are combined and exit from a single stack aft of the cowling. 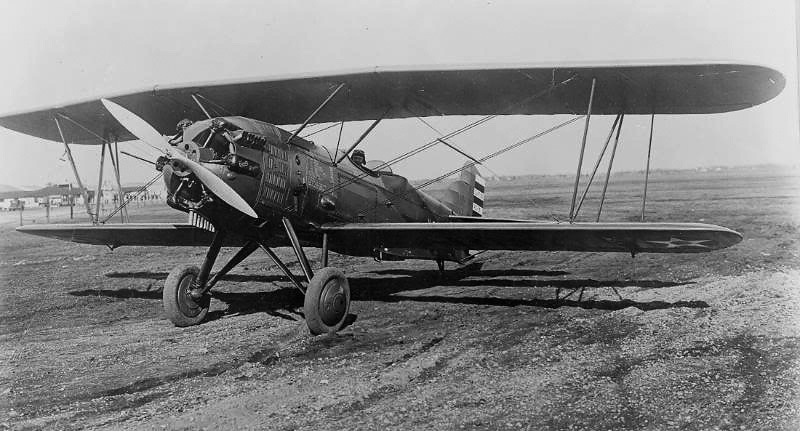 In October 1928, the Army ordered three Curtiss P-6 Hawk aircraft to be powered by the H-1640 engine and designated them XP-11. However, shortly after the order was placed, the engine’s cooling trouble became known and the engine’s development ceased. The aircraft were never built with the Chieftain engine. A total of eight H-1640 engines were made with six going to the Air Corps and two to the Navy. While the Chieftain’s design may have been problematic, the event that directly led to its lack of support and ultimate abandonment was the merger of Curtiss Aeroplane and Motor Company with Wright Aeronautical in July 1929. After the merger, the liquid-cooled engines were provided by Curtiss and the air-cooled engines from Wright. There was no longer a need for the Chieftain, an air-cooled engine of rather dubious design. However, the concept of a hexagonal engine would be revisited with the Wright H-2120. Reportedly, at least one Curtiss H-1640 Chieftain survives and is in storage at the National Air and Space Museum’s Garber Facility in Silver Hill, Maryland. The second Curtiss XF8C-1 re-engined with the H-1640 Chieftain and redesignated XOC3. This entry was posted in Aircraft Engines, Between the Wars on 9 November 2012 by William Pearce. There is a fairly complete Curtiss H-1640 engine at the Wings Over the Rockies Air and Space Museum in Denver. I’ve wondered whether a shaft geared, spun cooling fan…like the 1917 Salmson 9A’s ‘Canton-Unne’ or the Focke Wulf F190’s…placed in the opening, instead of those angled louvers–would have helped remedy air flow issues. That and better contoured, area inlet/outlet shaping below those vent louvers for escaping air between the inlet “V” pairs. I would imagine that an engine-driven cooling fan would have improved cooling. However, some of the engine’s power would need to be used to drive the fan. I think the real culprit was the inefficient flow of air into the cowling, through the cylinders’ course fins, and out of the cowling. Improved air-flow and finer cooling fins may have resolved the overheating issues, but with the Curtiss and Wright merger, the company focused its efforts elsewhere.